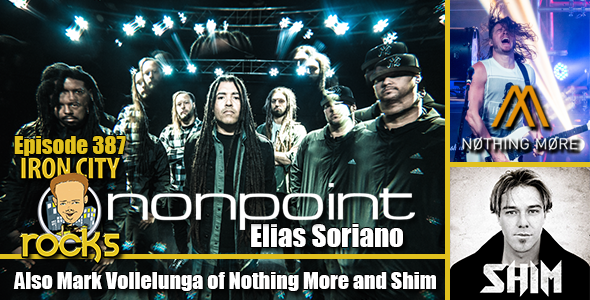 In Episode 387 of the Iron City Rocks Podcast we talk with Elias Soriano of Nonpoint. Elias talks to us about the the band’s latest album, X, the choice of producers, their high energy live shows and much more. We introduce you to Shim (Shimon Moore formerly of Sick Puppies) who is set to release his first solo album in September. Shim talks with us about his approach to being a first-time solo artist, working with a second guitarist and much more. Finally while on tour we sat down with Mark Vollelunga of Nothing More. Mark was on the road with Five Finger Death Punch and Breaking Benjamin and fills us in with all the details of the tour.